Originally Published in Productions Magazine Sept/Oct 2012 issue. Early acoustical theaters were just that – acoustic. The good news and the bad news are usually the same news when a venue sounds incredibly good at the start. An auditorium that projects natural sound well is most often over-powered and overloaded by modern musical performances and the line array sound systems that reinforce them. That’s the bad news in the good news. This type of good room will need to be modified to handle high-powered sound from modern music performances while keeping its sound-enhancing properties. All efforts can be directed into the “how” of doing the job when everyone has heard the “why” it needs to be done. The hard back wall of the stage is a significant source for monitor splash-back into the performers’ microphones, reducing gain-before-feedback and enhancing opportunities for system squeals. This is in addition to promoting timing confusion due to slap-back that is usually out of sync with the music. This disturbance and annoyance can be overcome by using materials from the province of industrial noise control. A factory finish, that is a finish for the factory, is also both “roadie-proof” and “on-the-road” compatible. Yes, you can take it with you. This allows one set of materials to follow the performances from one venue to the next. Bass control from an internal limp mass, Absorption from quilted fiberglass, and Resistance to abuse from a tough vinyl cover. The covering is thin enough to avoid reduced effectiveness at all but the highest frequencies and strong enough to withstand stage and road wear. Hanging mass (at one time plywood) with an absorptive cover is a long-standing studio technique to control low frequencies. 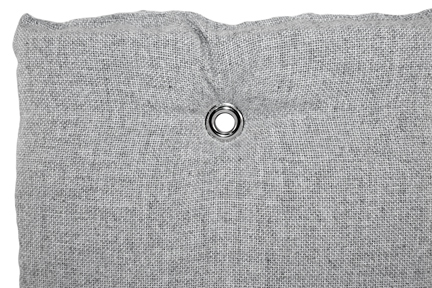 The newer, non-rigid barriers allow a curtain configuration that is invisible to the audience, while providing a clean sound source for the both the performers and the listeners. Above the stage, there is almost always a large cavity designed for lights and to accommodate rigging. This space can act as an unintended echo chamber. 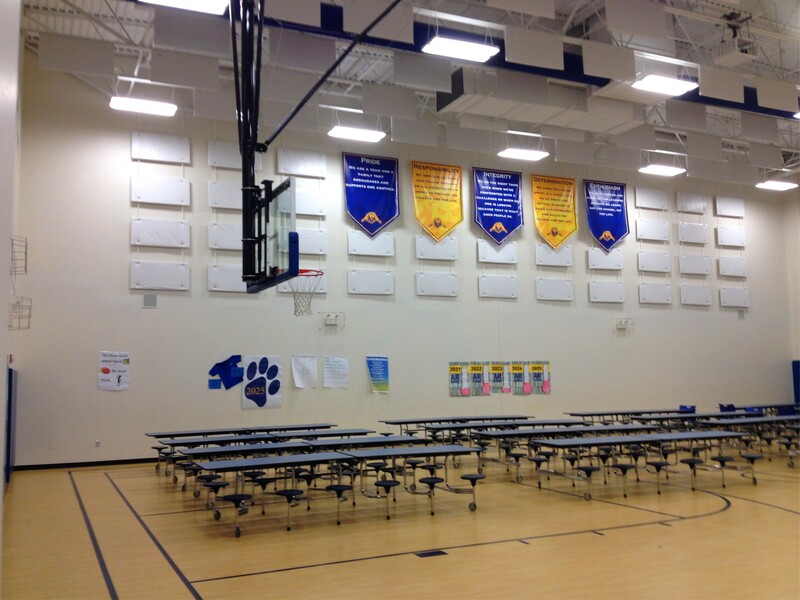 Being out of harms way, the area allows for a lighter and less costly sound treatment with acoustical baffles. Besides the obvious requirement that they work acoustically, they need only to be invisible (usually black) and pass the proper fire code. Acoustically, they have about twice the exposed sound absorbing surface as a wall-mounted panel, by hanging in free space. 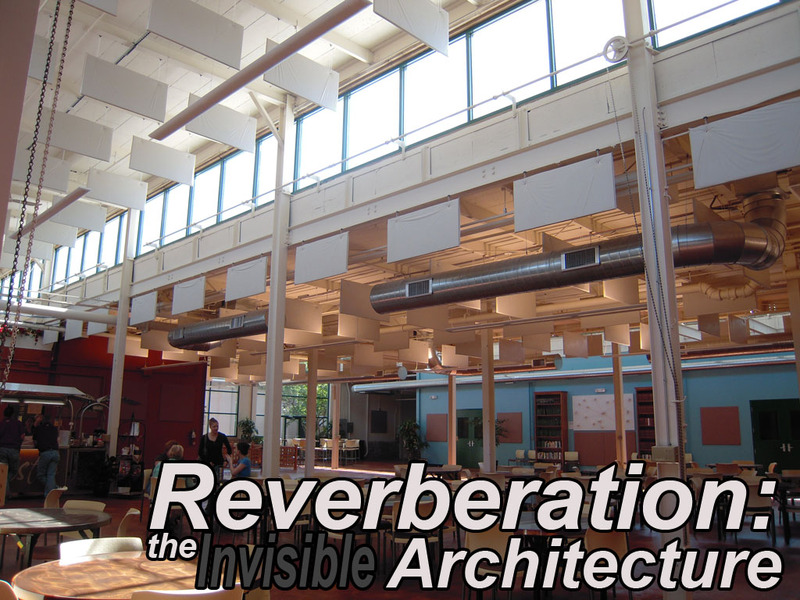 It’s more surface, less reverberation, out-of-sight and within budget. They are light enough and small enough to travel well if strung in a way that allows easy removal for relocation, such as threaded onto aircraft cable and hung in a line from side-to-side. 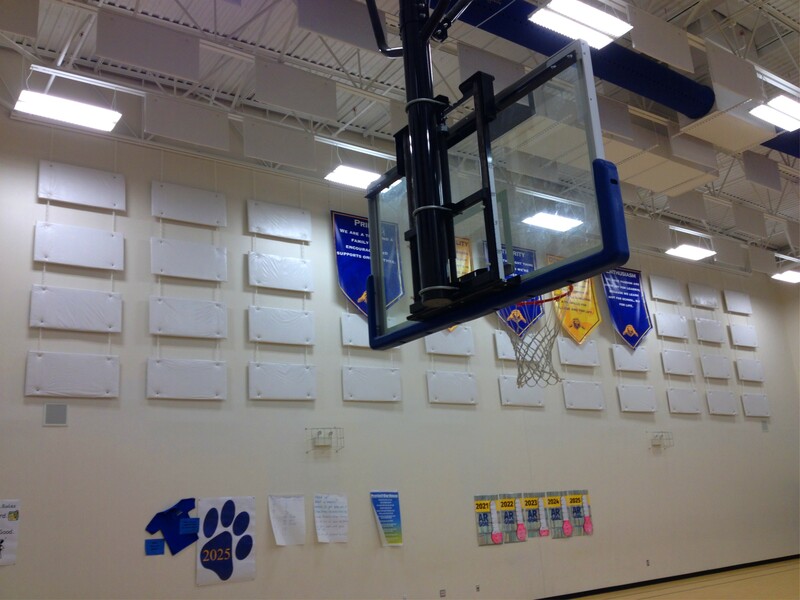 Adding a fabric finish to the baffles, produces a more decorative product, suitable to the audience side of the auditorium when a more permanent ceiling solution is required. 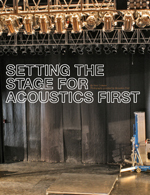 Stage one of acoustical control often is the stage. Both on-stage and in-studio sound isolation usually begin with structure borne sound traveling through the floor. It is always wise to implement isolation between instruments from the beginning, where it is a “cheap” fix rather a costly solution. This can be accomplished by floating the stage surface, and doing it in several separate sections. As noted previously with the hanging back of stage curtains, mass matters. Mass can come from many different materials whose properties are heavy and dense. They can be common materials such as gypsum or sand as well as more acoustically specific items like sheet lead or mass loaded vinyl barrier. (BlockAid® is a readily available example.) Added mass damps the damage of vibration and reduces ringing resonance. Once the stage goes “thud” when hit due to its added mass rather than a cartoonish “boing”, it is time to handle the hollow space beneath the stage and fill it with fluffy stuff. This can be whatever attic insulation that is on sale at the local home improvement store. It need only trap the air to prevent its becoming a big bass drum when stomped upon. Way back in the days of Disco (or Disco daze), complications arose in the studio from the required “lead-foot” kick drum getting into the acoustical piano by traveling through the studio floor as vibration and transmitted up the piano legs. Although studio floors are usually isolated from other rooms, they can still connect within a room. This problem was solved by floating the drum booth independent of the common recording studio floor. At that time this author’s studio went so far as to construct a sand-filled floor set on nine truck tires. The sand provided mass and inertia while the tires created de-coupling from the common structure. Today it is accomplished with high mass materials and off-the-shelf vibration pads, at about the same cost. Independent and transportable compact structures can be created for the individual instruments and be moved with very little heavy lifting. 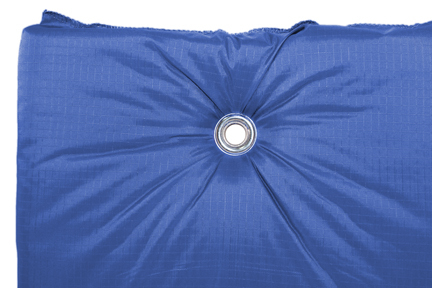 After stage resonance is reduced by adding a layer of mass loaded vinyl to its surface and the cavity below is stuffed with fiberglass to prevent its ringing or singing along with the music, a second stage may be layered on top of the original and floated on ribbed neoprene pads every 12 inches along standard, 16” on-center bracing. This keeps the guitar amp’s sound out of the vocal microphone stand, bass drum out of the piano legs, and so on, to create increased clarity and improved separation in the live performance. One technique used in early acoustical performance theaters was the overhead dome. This feature captured wasted sound energy and focused it back to the audience to reinforce sonic energy in areas where it had diminished with distance from the source. With new systems the level is electronically reinforced, not needing further enhancement, which confuses rather than clarifies. In addition, the dome creates a sonic racetrack where the sound moves around the edge in a swirling motion. Anyone who has been in a domed facility during a thunderstorm has heard how sound travels around the perimeter. The RCA dome in Indianapolis provided a good example to CEDIA attendees a few years ago . This phenomenon of raceway runaway can be abated with acoustical “speed bumps” of Melamine foam which easily bends to conform to curves*, keeping the look while truncating the travel of the fast moving sound waves. In this case being unfocused is a desirable trait. To reduce sound getting into the dome from the line arrays and the like, hanging baffles can be placed around the front half of the perimeter of the ellipse. These may be fabric covered to blend with the décor of the audience area and made from two-inch, seven pound per cubic foot density acoustical fiberglass to extend its absorption range. Being hanging baffles they do not permanently change the original architecture, where that is a concern. When acoustical treatments must be essentially permanent, high efficiency at low cost can be achieved with utility finishes that can be field-cut to fit spaces in cavities behind auditorium side curtains. Factory fit panels require precise measurements to install within curves. Field cutting skips this step as it is, by definition being, done in real time to as-built measurements rather than made to out-of-date plans. Savings derived from the unseen, utilitarian treatments can be applied to upscale finishes for panels in plain sight. Another common problem for an older theater in the modern world is sound returning from the balcony face. These are usually concave surfaces that not only send sound back but focus it for feedback as well. Convex curves such as polycylindrical “barrel shapes or semi-reflective half-round, hollow traps can control concave characteristics when interspersed with thicker, flat acoustical wall panels to achieve a combined “Flat” curve. Sound intensity can be reduced by the decision to destroy or diffuse. Absorption is the destructive choice, eliminating the problem by eliminating the sound. Care needs to be taken to use only what is necessary and no more. 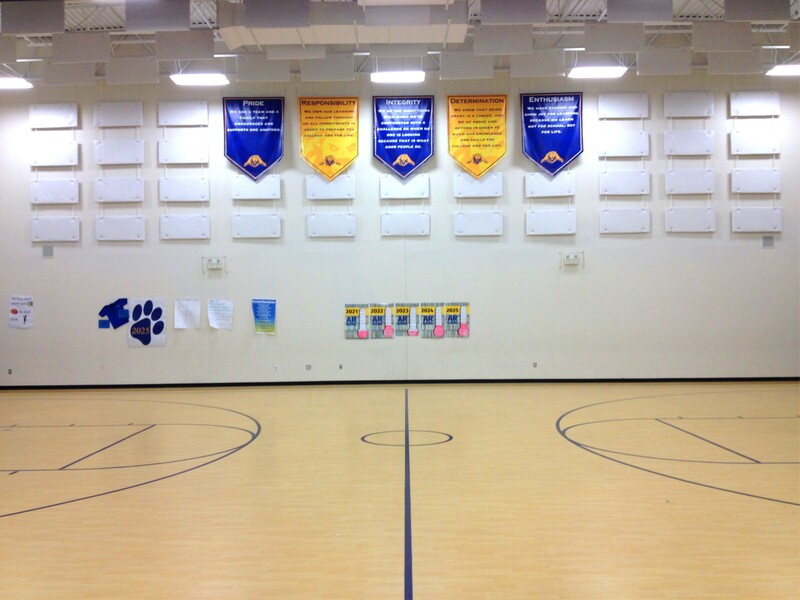 The other alternative is to spread the sound over a larger area to reduce intensity. This can be likened to spreading peanut butter on bread – it becomes easier to swallow although it is the same quantity as the original lump from the jar. With diffusion, a little goes long way. A single barrel shaped diffuser can clear up the cacophony of a board room without the deadness of absorption required for the same amount sound clarification. With venue retrofits, some tweaks can be made after opening. Covering all walls before there is an evaluation with performers and audience, is not always a good idea. While it may be theoretically possible to model and predict acoustical performance, it can be more economical and efficient to get the room in a reasonable range and polish to the real world result. An informed conclusion, upon hearing the room in use, can produce an optimum result. Nick Colleran is past-president of SPARS (Society of Professional Audio Recording Services), past president of the VPSA (Virginia Productions Services Association), a former recording artist and audio engineer. Starting in 1978, his company began supplying unique acoustical materials. Nick now leads a “quiet life” as a principal of Acoustics First Corporation. The company holds patents for several innovative acoustical products. 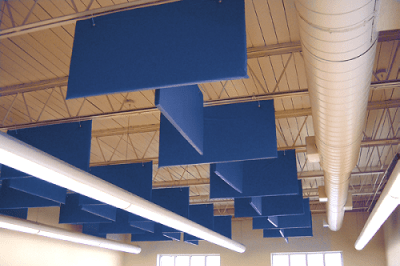 Acoustics First designs, manufactures and distributes products to control sound and eliminate noise for commercial, residential and industrial uses. Originally published by Home Toys.